Inspired by a historical encounter, a child remembers Canadian artist Tom Thomson teaching her to paint during a summer sojourn at her father’s lakeside home. As in the creative team’s The Art Room (2002), a similar tribute to Canadian artist Emily Carr, Vande Griek’s spare, poetic narrative links a series of harmonious scenes done in strongly brushed strokes of greens, blues, and golds. Arriving at the lakeside house one afternoon in a canoe filled with “fishing gear, / camping gear, / painting gear,” Tom makes mulligatawny stew over a campfire and then, as days pass, ventures out with the young observer to paint flowers and boats, trees, and moonlight on water. All the while, as a sort of refrain, the west wind blows “gentle” or “fresh,” “light” or “wild,” and when at last it blows “away” with July’s passage, the young man too departs. 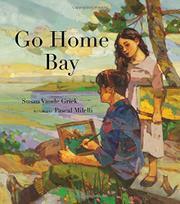 Milelli incorporates inexact but evocative versions of some of Thomson’s paintings into his outdoorsy illustrations, and Vande Griek closes with a biographical note enlarging on the 1914 visit and the painter’s prominent place in the history of Canadian art.